What’s your favorite animal book? Update: A big thanks to everyone who shared their favorite animal-themed books! We assigned a number to each comment and used random.org to generate two random numbers. The numbers were 7 and 27. This means the winning commenters were “Gracenawati” and “Magdalena_B”! Please contact us through our website to let us know where we should send your CD! Congrats! Since we’re having so much fun with our animals topic this month, we wanted to share with you a top ten list of our favorite animal-themed picture books. We’d also love to know what your favorite animal books for young learners are! Just leave a comment below with your favorite animal-themed book or books, and we’ll enter you in a drawing to win a copy of our Super Simple Songs – Animals enhanced CD. We’ll select two winners at random from the comments section. The fine print: One entry per person please and to be eligible, your comment must be posted here on the blog, not on Facebook. If you live somewhere we’re not able to ship to, we’ll send a download version instead. Contest ends April 22, 2013 at 12pm PST. While most of the books on this list are appropriate for preschoolers and younger, we like this one for preschool and up. 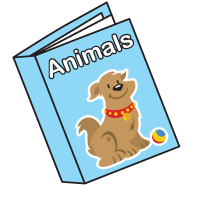 Great for introducing and reviewing animals and clothing. 9. Whose Baby Am I? This book has beautiful, warm illustrations of baby animals. Turn the page to see the baby together with its parent. Maisy has a lot of animal friends, so any Maisy book is great for talking about animals. This one introduces farm animals and farm chores. Young learners always love Maisy! This classic lift-the-flap book introduces zoo animals and descriptive adjectives (heavy, big, tall, etc.). Sandra Boynton’s books are written and illustrated with a sense of humor that kids of all ages enjoy. This is a great book for introducing farm animals and the sounds they make. This lift-the-flap book is another great one for introducing farm animals and the sounds they make. Toddlers and younger in particular will appreciate the large bright images and flaps. Eric Carle has a lot of great animal books. We love this one because of the variety of animals and it is great for teaching actions, parts of the body, and abilities (“I am a giraffe and I bend my neck. Can you do it?”). Perfect for bedtime, this book introduces zoo animals in an adorable story. This lift-the-flap book isn’t specifically about animals, but Spot has a lot of animal friends you can talk about while looking for Spot. Another great one from Eric Carle (with Bill Martin), this book teaches colors while introducing a variety of animals. Excellent for teaching the rhythm of English.